Average Weight	: 45-60 lbs. The Chinese Shar-Pei can be traced back to the province of Kwung Tung. It has existed in the southern provinces of China for centuries. Pictures on pottery suggest the breed had existed even as far back as 206 BC. They were typically the dogs of peasants. They helped the peasants with herding cattle, guarding the family and the home, and are qualified hunters of mainly wild pigs. Shar-Pei translated actually means "sand skin" or "shark skin." This rough and prickly coat was excellent in the dog fighting pits because it allowed the dogs to wiggle out of their opponent's grasp. In China they are referred to as fighting dogs and in Canada and the United States are referred to as guard dogs. They both reflect the same idea that these dogs were used for protection. After the establishment of the People's Republic of China as a communist nation the dog population was virtually wiped out. Thanks to Matgo Law and his dedication to the breed, a small number of Shar-Pei's were brought over to the United States in the 1960's and 1970's. 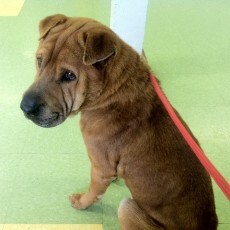 **In fact I interviewed the new owner of the 1st Shar-Pei that arrived in Canada in the mid-1970's. The name "Shar-Pei" means sandy coat. The dogs were used as multipurpose working farm dogs for the Chinese, hunting, tracking, as a ratter, herding, protecting stock, and guarding the home and family. The dogs happily worked all day long. It was also used in dog fighting events where their loose skin and extremely prickly coat made it hard for the other dog to grab onto. The Chinese believed that the image of the wrinkles and black pigmented mouth would scare off any evil spirits. During the Communist Revolution the Shar-Pei population dwindled. In 1973 a Hong Kong businessman named Matgo Law acquired a few of these dogs in an attempt to save the breed. He attracted people's attention through an American magazine. From those few dogs the Shar-Pei's numbers have risen tremendously and it is now one of the more popular breeds in the USA. The breed has over 70,000 dogs registered as foundation stock. •	Can be friendly with strangers. •	Good with cats and small children ~ if introduced to them when they are still puppies, young. •	Easy going, calm and independent. •	Needs a confident owner. •	Easily will take charge if owner doesn't demonstrate leadership skills. •	Needs a firm, gentle, consistent authority figure. •	Can be stubborn and bold. •	Needs firm obedience training. Not the easiest of breeds to train. •	Not always good with other dogs, especially other dominant dogs. •	Considered a "Yuppie Puppy" in the 1980's when their popularity soared. •	Prone to kidney failure. The Shar-Pei is considered to be an excellent family dog. It is devoted to its family and owners and makes an excellent watch dog. Their standoffishness will minimize with regular visitors. They generally do well with children and other pets when they are socialized around them as a very young puppy. Although they are standoffish around strangers they are not considered to be unfriendly. The Shar-Pei has an extremely dominant and independent nature and therefore it is pertinent that they have a handler who can show the dog who is boss. If the handler is uncertain or wavers in their commands and training, the Shar-Pei will take over as boss and become very dominant. It is suggested that Shar-Peis are for experienced dog owners. They will refuse commands from family members who have not established a level of dominance with them. The Shar-Pei has a high dislike of water. They will avoid water for baths, but have been known to enter ponds, oceans, lakes, rivers, etc. of their own accord. Consequently, the Shar-Pei should be trained from an early age to accept being bathed. Shar-Pei's are excellent house pets because they are considered to be extremely clean. In fact, the Shar-Pei will basically house break itself. This will make having a puppy in the home a little easier. Despite their desire for cleanliness, they do shed some and tend to slobber and drool especially when in pain. It is important for this breed to be socialized around other dogs from a very young age. They have a history of being involved in the dog fight pits and therefore can be aggressive towards other dogs. It is important when buying a Shar-Pei to be very cautious of their breeding lines. This dog was carelessly over-bred during the 1980's and therefore the personality and health of the dog depends on the genetics of the dog. When looking into the history of the breeding lines, it can usually be determined if that line of dogs is aggressive or not towards other dogs. The grooming level of the Chinese Shar-Pei is considered to be low or minimal. They do need to be brushed regularly to remove dead hair and then brushed daily during shedding season to reduce the amount of shedding. Despite the low maintenance of the Shar-Pei there are some special considerations. Special attention needs to be given to the ears of the Shar-Pei. It is essential that you never wash the Shar-Pei's head. Getting water in the ears of the Shar-Pei can cause serious problems for them that do not appear in other breeds. They have very tiny ear canals and water in the ears can cause serious ear infections. Some tend to collect more dirt and wax than others and this should be cleaned our prior to bathing. A waterless dog shampoo can be used on the head and then wiped with a damp cloth. An ear drying solution can be used after the bath just incase some water did get into the ears. Bathing should be done about once a month. During the bath, it may be useful to use a rubber brush to get rid of some of the shed. A specialty dog shampoo should be used because human shampoos and liquid soap can cause skin irritation. This is exceptionally important with this dog because skin irritation and skin problems are prevalent. Take extra care to make sure all the soap residue has been rinsed and make sure that special attention is given to in between all the folds in the skin. Drying after the bath is essential for this dog as well. Again it is important to make sure that the skin between all the folds is given extra attention and dried thoroughly. The Shar-Pei should be dried with a drier on moderate heat. A light amount of baby powder or specialty grooming powder can be used for in the folds to ensure that the dampness is gone to prevent skin irritation. Professional grooming may be recommended for the bathing process because of the Shar-Pei's hatred for the water. It may be difficult for the owner to bathe them at home. The Shar-Pei does have a considerable need for exercise. It is necessary for this breed to get outside and have activity because they will be more peaceful and content indoors when they have had enough outdoor activity. However, the Shar-Pei because of its origin as a fighting dog, does need to always be kept on a leash to avoid confrontation and fighting with other dogs. Because of their padded head they are very sensitive to heat. It is important for Shar-Pei to have access to water and shade when it is outdoors. Over exercise should be avoided when it is really hot outside. The Shar-Pei is a dog that also hates the water and they have very sensitive ear canals and therefore should not get water in their ears. This dog is not meant to be a dog for the water or for playing fetch or swimming with the family at the lake. They are capable of handling cold weather much better than warm weather. This makes them excellent dogs for moderate to cooler climates. Training for the Shar-Pei is very important from a young age. It is very important that they be socialized at an early age. They can be quite aggressive towards other dogs and therefore should get used to being around other animals from a young age to reduce this. They are typically playful with children but again will do better if they are socialized around children from a young age. Socialization is also important because the Shar-Pei is known to get attached to only one person. They will protect and defend this person if they feel there is a threat. They will adjust to being a family dog and be loyal to the whole family. Socialization can help to minimize their aggressive nature. If not socialized correctly, they can be aggressive towards other dogs and their standoffishness around strangers can turn into shyness or sometimes aggression. The Shar-Pei can have a very dominant and stubborn nature and therefore training can be quite difficult. It is important for the handler to have a strong, direct, and consistent training. The Shar-Pei needs to have a handler who can be the "Top Dog" so to speak. If the handler is soft, inconsistent, or wavering in their commands and training, the Shar-Pei will take over and become the dominant one in the relationship. Firm handling is the best method for this dog. However, they can be defiant in a family setting because they may only respond to commands from one person. It is important that if the dog is in a family setting that the dog gets trained to respond to all members of the family in the same way. It can be frustrating for the family if the dog responds to one family member and then acts dominantly towards others. Despite the firm handling that is necessary, there is one thing that the Shar-Pei does not need extensive training on. The Shar-Pei is known to house break itself. So, that makes life a little easier for the owner when the dog is a puppy and being integrated into the home.